Ibn Al Xu'ffasch (Son of the Bat). Gads, I can't even begin to pronounce it. Lucky for us the writer (Mark Waid) mercifully truncated it to "Ibn" for most of the dialogue (for those of us who still hear the words in our heads while we read). In this book, Ibn, the son of the Bruce Wayne and Ra's Al Ghul's daughter, Talia, resurrects 3 "dead" villains (Brainiac, Lex Luthor, and Ra's Al Ghul) to engineer a device that will protect Ibn from changes in his timeline. Of course, the three try to backstab him but Ibn (being the son of the Batman) had prepared for that eventuality. The book climaxes with a brief battle between Ibn and his grandfather, in which Ra's explains that he "planned" for Ibn to supplant the Batman and inherit his empire. 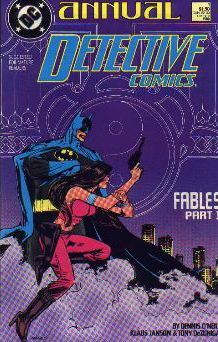 This is another book (that unfortunately you probably won't find in a quarter bin yet) that explores what would happen if Talia and Bruce Wayne had a son. In this "Elseworlds" book, Bruce Wayne is dead under unexplained circumstances but apparently everyone else in the DC universe is alive. 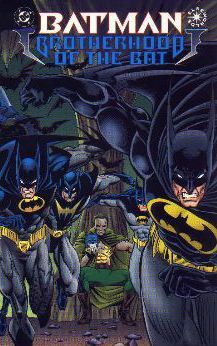 Ra's Al Ghul resurrects Batman's costumes (oy) and tries to take over Gotham with his own legion of Batmen. This book was a little closer to what I'd expect -- the Batman's son is pretty much another Batman (although this comes off as kind of lame, how he gets inspired is by reading about his father's exploits). What's interesting is that this book COULD fit into continuity, if it weren't labelled Elseworlds (DC Comics' imaginary stories) and if it weren't so lame. See below....! 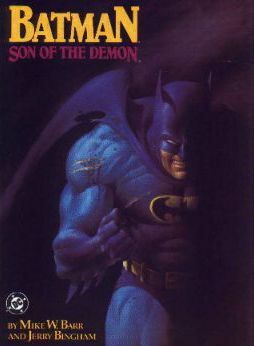 Son of the Demon is one of my favorite Batman stories in general. It's got romance, good action, a real evil bad guy, a murder mystery thrown in for good measure. 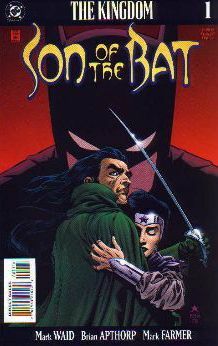 In this book we see Batman making an alliance with Ra's Al Ghul, and in the process, accepting Talia as his wife. There's a full page where they're together on their wedding night and then a few battles later, Talia drops the bomb on Batman. ( Click HERE) I still get a grin when I read that scene. At this point I haven't said too much about Talia. If you're curious, try picking up a copy of the trade paperback, Batman: Tales of the Demon. It retells the first conflicts between Batman and Ra's Al Ghul, and introduces Talia. You can see why Batman had a special relationship as well. ( Click HERE). On a final note, I realize that there were many Silver-Age stories in World's Finest that dealt with the topic of "the Sons of Batman and Superman" -- man, that just sounds too funny. 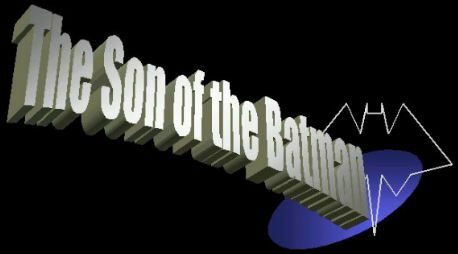 But Batman's son in those stories was created "magically" and was not the product of Bruce Wayne and Talia -- something that writers in all of the aforementioned books seemed to agree upon.